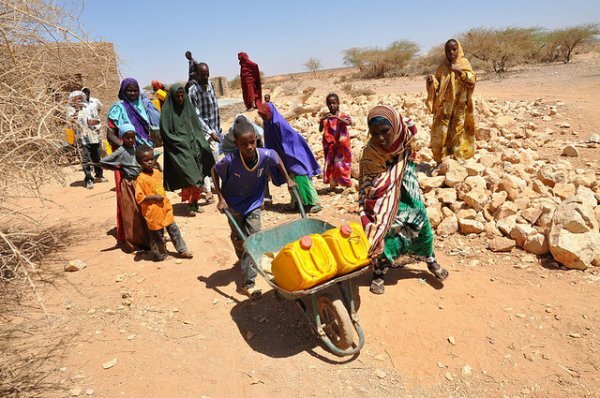 The Somaliland administration is undertaking an $800,000 project to build a reservoir and water distribution pipelines that will serve about 80,000 residents, mostly IDP’s, in Hargeisa's Ahmed Dhagah District. Construction of the reservoir began December 15th , and project officials say they expect it to be operational as the region enters its rainy season at the end of April . Hargeisa Water Agency Director Ibrahim Siyad Yonis said the reservoir is expected to produce 1,000 cubic metres per day, equal to 5,000 barrels. "Considering seasonal changes, this will regularly supply water for at least nine months each year," he told Sabahi. Workers are digging the reservoir near a canal that traverses Hargeisa, a city of more than 800,000 residents, and will supply water to residents of the Ayah 1, Ayah 2 and Sheikh Omar neighbourhoods in Ahmed Dhagah District. No taps will be installed in people's houses, but residents of the three neighbourhoods will be able to draw drinking water from 15 sites, Yonis said. "The residents of those neighbourhoods, most of whom are internally displaced individuals, will get clean and affordable water that is guaranteed to be healthy," he said. Pumps will be used to draw water from the canal into the reservoir, which will then feed water to the 15 distribution points via a network of pipes. The reservoir will be able to store 100,000 cubic metres of water, or 500,000 barrels, he said. On March 12th , Somaliland Administration Vice President Abdirahman Abdullahi Saylii officially laid the foundation for the water storage facility in Haraf District. Interior Minister Mohamed Nur Arrale, Minister of Youth, Sports and Tourism Ali Said Raygal, Assistant Minister of Mining, Energy and Water Resources Abdisalam Mohamed, and Ibrahim Siyad Yonis also attended. The Hargeisa Water Agency is overseeing the project with help from the United Nations Children's Fund, non-profit Terre Solidali, and the Coca-Cola Company through Somaliland Beverage Industries, its local producer, Yonis said. However, the new reservoir will only partially solve the water scarcity problem in Hargeisa, said Abdirahman Adam Aar, an economics instructor at the Civil Service Institute. Most of the city's residents "will continue to rely on water supplied by water tankers from wells outside of the city that have unclean water", Aar told Sabahi. "This is an economic burden on the residents, but if this new venture is expanded, it can alleviate the problem," he said. Abdi Sheikh Mohamed, who owns one of these water tankers, estimates that he fetches water about three times a day from wells at Jalelo, Dararweyne and Hubnoweyne, 35 kilometres east of Hargeisa. "Previously [the cost was] 7,000 shillings per barrel, but we increased the amount in the last two months to 10,000-12,000 shillings because water is becoming more scarce and we spend hours on the trip with fuel becoming more expensive," Mohamed told Sabahi. In contrast, Yonis said the Hargeisa Water Agency, which supplies the city with 62% of its potable water, charges considerably less money -- 1,900 shillings per barrel.